Why choose between clever design and good looks? 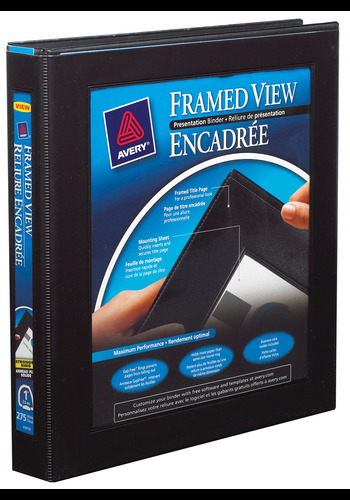 This Framed View Binder has both. The professional-looking frame with a patented mounting sheet holds a title page firmly in place. Free templates from Avery® Design & Print online lets you add company logos, photos, graphics and text so you can create an attractive title page that turns heads. This Framed View Binder has both. The professional-looking frame with a patented mounting sheet holds a title page firmly in place. Free templates from Avery® Design & Print online lets you add company logos, photos, graphics and text so you can create an attractive title page that turns heads. Inside the binder, Gap Free rings hold paper securely, while the One Touch™ design makes sheets easy to access and remove. Through and through, this binder was made for professionals.